1. PREMISES: In consideration of the payment of rent and performance of the covenants and agreements by Tenant, as hereinafter set forth, Landlord hereby leases to Tenant those certain premises designated on the plan attached hereto as EXHIBIT A and incorporated herein by this reference (the "Premises"), consisting of a total of approximately _____ rentable square feet of space and known as _________________________ presently known as the ________________, located on the real property more particularly described on EXHIBIT B attached hereto and incorporated herein by this reference (the "Real Property") together with a non-exclusive right, subject to the provisions hereof, to use all appurtenances thereto, including, but not limited to, any common areas or other areas of the Real Property designated by the Landlord for the exclusive or non-exclusive use of the tenants of the Building. The Building, Real Property, common areas and other appurtenances may hereinafter be referred to as the "Building" or the "Building Complex". This Lease is subject to the terms, covenants and conditions set forth herein and Tenant and Landlord each covenant as a material part of the consideration for this Lease to keep and perform each and all of said terms, covenants and conditions to be kept and performed by them. (a) The term of this Lease shall be for twelve (12) months (the "Primary Lease Term") commencing at 12:01 a.m. on ____________ (the "Commencement Date") and terminating at 11:59 p.m. on ____________ (the "Termination Date"), unless sooner terminated pursuant to the terms hereof. In the event the Premises are not "Ready for Occupancy" as such Term is defined below, the Commencement Date shall mean and refer to the date the Premises are Ready for Occupancy. The Primary Lease Term as it may be extended shall be referred to herein as the "Term". (b) Other than as set forth in a work letter attached hereto and incorporated herein as EXHIBIT C (the "Work Letter"), Landlord shall have no obligation for completion or remodeling of the Premises and Tenant shall accept the Premises in its "AS IS" condition on the date Landlord delivers possession to the Tenant. If Landlord has agreed to complete the work in the Premises, such work shall be set forth in the Work Letter. If the Premises are not Ready for Occupancy (as hereafter defined) on the Commencement Date, unless such delay is caused by Tenant, its agents or employees, the rental obligations hereunder shall not commence until the Premises are Ready for Occupancy, provided, however, other than the payment of Rent, this Lease and all covenants, conditions and terms hereof shall be in full force and effect. The postponement of the Tenant's obligation to pay Rent and other sums herein provided for such period shall be in full settlement for all claims which Tenant might otherwise have by reason of the Premises not being Ready for Occupancy on the Commencement Date. If Landlord is delayed in delivering the Premises to Tenant because the same are not Ready for Occupancy or due to the failure of a prior occupant to vacate the same, then the Rent and commencement of the Term shall be postponed as hereinabove set forth, and such postponement shall be in full settlement of all claims which Tenant may otherwise have by reason of the delay of delivery. "Ready for Occupancy" as used herein shall mean the date that Landlord shall have substantially completed any remodeling work to be performed by Landlord to the extent set forth in the Work Letter. The certificate of Landlord's representative in charge of supervising the completion or remodeling of the Premises shall control conclusively the date upon which the Premises are Ready for Occupancy. If Landlord has agreed to perform work in the Premises, Landlord shall provide Tenant with notice that the Premises are Ready for Occupancy. (c) If, as a result of the postponement or acceleration of the Commencement Date, the Term would begin other than on the first day of a calendar month, the Commencement Date shall be delayed until the first day of the next calendar month and the Primary Lease Term shall be calculated from such date. Tenant shall pay proportionate Rent at the same monthly rate set forth herein (also in advance) for such partial month. (d) "Lease Year" as used in this Lease shall mean each twelve (12) month period beginning with the Commencement Date, or any anniversary thereof and ending on the preceding day one (1) year later. (e) Taking possession of the Premises by Tenant shall be conclusive evidence as against Tenant that the Premises were in the condition agreed upon between Landlord and Tenant, and acknowledgment of satisfactory completion of the work which Landlord has agreed in writing to perform, if any, except as otherwise set forth in this Lease and except as may be reflected in any written agreement to the contrary (i.e. a punchlist), signed by both Landlord and Tenant. All installments of Base Rent shall be payable in advance, on the first (lst) day of each calendar month during the Term hereof. Rent for any period less than a full calendar month shall be prorated based upon the number of days during said month that the Lease Term was in effect. One monthly installment of Base Rent shall be due and payable on the date of execution of this Lease by Tenant. All Base Rent shall be paid without notice, demand, deduction or offset, at the office of Landlord or to such other person or at such other place as Landlord may designate in writing. Tenant shall pay to Landlord as "Additional Rent" all other sums due under this Lease. Base Rent and Additional Rent may be referred to herein as "Rent". This Lease is considered a "modified gross lease" with the "Base Year" Operating Expenses included in the Base Rent. Increases in Operating Expenses, if any, subsequent to the Base Year shall be passed-through to Tenant based upon "Tenant's Prorata Share" of the Building as more specifically described in Article 5 hereof. 4. SECURITY DEPOSIT: It is agreed that Tenant, concurrently with the execution of this Lease, has deposited with Landlord, and will keep on deposit at all times during the Term hereof, the sum of zero Dollars ($0.00), the receipt of which is hereby acknowledged, as security for the payment by Tenant of the Rent and all other sums herein agreed to be paid and for the faithful performance of all the terms, conditions and covenants of this Lease. If, at any time during the Term hereof, Tenant shall be in default in the performance of any provisions of this Lease, Landlord shall have the right, but shall not be obligated, to use said deposit, or so much thereof as necessary, in payment of any Rent in default, reimbursement of any expense incurred by Landlord, and in payment of any damages incurred by the Landlord by reason of Tenant's default. In such event, Tenant shall, on written demand of Landlord, forthwith remit to Landlord a sufficient amount in cash to restore said deposit to its original amount. In the event said deposit has not been utilized as aforesaid, said deposit, or as much thereof as has not been utilized for such purposes, shall be refunded to Tenant, without interest, within sixty (60) days after the termination of this Lease upon full performance of this Lease by Tenant and vacation of the Premises by Tenant. Landlord shall have the right to commingle said deposit with other funds of Landlord. Landlord may deliver the funds deposited herein by Tenant to any purchaser of Landlord's interest in the Premises in the event such interest is sold, and thereupon Landlord shall be discharged from further liability with respect to such deposit. If the claims of Landlord exceed the amount of said deposit, Tenant shall remain liable for the balance of such claims. At Landlord's election, Landlord may have the Security Deposit held by Landlord's manager in a separate security deposit trust, trustee or escrow account established and maintained by such manager with respect to certain security deposits of tenants within the Building. Unless Tenant is so notified (i) Landlord will hold the Security Deposit and be responsible for its return; and (ii) Tenant may request return of the Security Deposit by giving Landlord written notice in accordance with the provisions of the Lease and Landlord's manager, if any, agrees that in the event of a dispute of the ownership of the Security Deposit, the manager will not wrongfully withhold Landlord's true name and current mailing address from Tenant. In the event such interest be sold, and thereupon, Landlord shall be discharged from further liability with respect to such Security Deposit. If the claims of Landlord exceed said Security Deposit, Tenant shall remain liable for the balance of such claims. (1) "Building Rentable Area" shall mean approximately ________ square feet which is all the rentable space available for lease in the Building. If there is a significant change in the aggregate Building Rentable Area, of a permanent nature, as a result of an addition to the Building, partial destruction thereof or similar circumstance, Landlord's space planner or architect shall determine and make an appropriate adjustment to the provisions herein. Unless otherwise provided herein, any statement of square footage set forth in this Lease or that may have been used in calculating Rent and/or Tenant's Pro Rata Share of Operating Expenses is an approximation which Landlord and Tenant agree is reasonable, and the Rent and Tenant's Pro Rata Share based thereon is not subject to revisions during the Primary Lease Term whether or not the actual square footage is more or less. (2) "Tenant's Pro Rata Share" shall mean a fraction, the numerator of which is the rentable area of the Premises (i.e. approximately _______ square feet) and the denominator of which is the Building Rentable Area, and is equal to ______%. (i) Costs of supplies, including but not limited to the cost of "relamping" all standard Building lighting as the same may be required from time to time. (iii) Costs of water and sanitary and storm drainage services. (iv) Costs of janitorial and security services, if any. (v) Costs of general maintenance and repairs, including costs under HVAC and other mechanical maintenance contracts; and repairs and replacements of equipment used in connection with the maintenance and repair work. (vi) Costs of maintenance and replacement of landscaping and sprinkler systems; seasonal/holiday decorations; and costs of supplies, maintenance, repair, striping and repaving of parking areas, common areas, plazas and other areas of the Building, including trash and snow removal. (vii) Insurance premiums, including fire and all-risk and special form coverage, together with loss of rent endorsement; the part of any claim required to be paid under the deductible portion of any insurance policy carried by Landlord in connection with the Building; commercial liability insurance; and any other insurance carried by Landlord on the Building or any component parts thereof. (viii) Labor costs, including wages and other payments, costs to Landlord of workmen's compensation and disability insurance, payroll taxes, welfare fringe benefits and all legal fees and other costs or expenses incurred in resolving any labor disputes. (ix) Professional building management fees in an amount comparable to that charged for comparable buildings in comparable projects in the __________ metropolitan area. (x) Legal, accounting, inspection and other consultation fees (including, without limitation, fees charged by consultants retained by Landlord for services that are designed to produce a reduction in Operating Expenses or reasonably to improve the operation, maintenance or state of repair of the Building) incurred for the normal prudent operation of the Building. (xi) The costs of capital improvements and structural repairs and replacements made in or to the Building or the cost of any machinery or equipment installed in the Building in order to conform to changes, in any applicable laws, ordinances, rules, regulations or orders of any governmental or quasi-governmental authority having jurisdiction over the Building (herein, "Required Capital Improvement"); the costs of any capital improvements and structural repairs and replacements designed primarily to reduce Operating Expenses (herein, "Cost Savings Improvements"); and a reasonable annual reserve (not to exceed ___ cents ($___) per rentable square foot for all other capital improvements and structural repairs and replacements reasonably necessary to permit Landlord to maintain the Buildings as an office building. The expenditures for Required Capital Improvements and Cost Savings Improvements shall be amortized at a market rate of return over the useful life of such capital improvement or structural repair or replacement (as reasonably determined by Landlord). Tenant shall be liable for and shall pay at least ten (10) days before delinquency and Tenant hereby agrees to indemnify and hold Landlord harmless from and against any liability in connection with, all taxes levied against any personal property, fixtures, machinery, equipment, apparatus, systems and appurtenances placed by or on behalf of Tenant in or about or utilized by Tenant in, upon or in connection with the Premises. Tenant shall pay to Landlord, as Additional Rent, any excise, sales, privilege or other tax, assessment or other charge (other than income or franchise taxes) imposed, assessed or levied by any governmental or quasi-governmental authority or agency upon Landlord on account of this Lease, the Rent or other payments made by Tenant hereunder, any other benefit received by Landlord hereunder, Landlord's business as a lessor hereunder, or other in respect of or as a result of the agreement or relationship of Landlord and Tenant hereunder. (4) If Landlord selects an accrual accounting basis for calculating Operating Expenses, Operating Expenses shall be deemed to have been paid when such expenses have accrued in accordance with generally accepted accounting principles. (5) Operating Expenses shall expressly exclude Landlord's income taxes; leasing commissions, advertising and promotional expenses; interest on debt or amortization payments on any mortgages or deeds of trust; costs of repairs or other work occasioned by fire, windstorm or other casualty to the extent of insurance proceeds received; and depreciation on the Building. (b) It is hereby agreed that Tenant shall pay to Landlord as Additional Rent during each calendar year during the Term hereof Tenant's Pro Rata Share of Operating Expenses in excess of the Base Year Operating Expenses. The Base Year Operating Expenses as used herein shall mean the actual Operating Expenses for the Building for the calendar year ____. An estimated amount of such Operating Expenses excess shall be payable monthly on the same date and at the same place Base Rent is payable, with an adjustment to be made between the parties at a later date as hereinafter provided. (1) Landlord shall deliver to Tenant, as soon as practicable following the end of any calendar year of the Lease Term, an estimate of the increases, if any, in Operating Expenses in excess of the Base Year for the new calendar year (the "Budget Sheet"). Until receipt of the Budget Sheet, Tenant shall continue to pay its monthly Tenant's Pro Rata Share of increases, if any, in Operating Expenses based upon the estimate for the preceding calendar year. To the extent that the Budget Sheet reflects an estimate of Tenant's Pro Rata Share of increases in Operating Expenses for the new calendar year greater than the amount actually paid to the date of receipt of the Budget Sheet for the new calendar year, Tenant shall pay such additional amount for each month of the new calendar year elapsed before receipt of such Budget Sheet to Landlord within thirty (30) days after receipt of the Budget Sheet. Upon receipt of the Budget Sheet, Tenant shall thereafter pay the amount of its monthly Tenant's Pro Rata Share of increases, if any, in Operating Expenses as set forth in the Budget Sheet. As soon as practicable following the end of any calendar year, usually by May 1st, Landlord shall submit to Tenant a statement in reasonable detail describing the computations of the Operating Expenses, setting forth the exact amount of Tenant's Pro Rata Share of increases, if any, in Operating Expenses for the calendar year just completed (the "Statement"), and the difference, if any, between the actual Tenant's Pro Rata Share of increases in Operating Expenses for the calendar year just completed and the estimated amount of Tenant's Pro Rata Share of increases in Operating Expenses paid by Tenant to Landlord. Notwithstanding the foregoing, Landlord's failure to deliver the Statement to Tenant on or before May 1st shall in no way serve as a waiver of Landlord's rights under this Paragraph. To the extent that the actual Tenant's Pro Rata Share of increases in Operating Expenses for the period covered by the Statement is higher than the estimated Tenant's Pro Rata Share of increases in Operating Expenses which Tenant previously paid during the calendar year just completed, Tenant shall pay to Landlord such balance within thirty (30) days following receipt of the Statement from Landlord. To the extent that the actual Tenant's Pro Rata Share of increases, if any, in Operating Expenses for the period covered by the Statement is less than the estimated Tenant's Pro Rata Share of increases, if any, in Operating Expenses which Tenant previously paid during the calendar year just completed, Landlord shall credit the excess against any sums then owing or next becoming due from Tenant under the Lease. 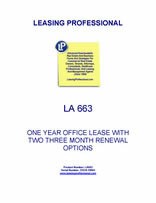 (c) If the Lease Term hereunder covers a period of less than a full calendar year during the first or last calendar years of the Term hereof, Tenant's Pro Rata Share of increases in Operating Expenses for such partial year shall be adjusted accordingly to reflect the number of months in such year during which Tenant leased the Premises. (d) After written notice to Landlord, Tenant shall have the right at its own expense and at a reasonable time during Landlord's regular business hours within thirty (30) days after receipt of the Statement to engage a certified public accountant ("Tenant's Accountant") to audit Landlord's books relevant to the disputed amount of Landlord's Statement of Operating Expenses under this Paragraph 5. In the event Tenant does not audit Landlord's books and deliver the results thereof to Landlord within said 30-day period, the terms and amounts set forth in the Statement shall be deemed conclusive and final. In the event Tenant's examination reveals that an error has been made in Landlord's determination of Tenant's Pro Rata Share of increases in Operating Expenses and Landlord agrees with such determination, then the amount of such adjustment shall be payable by Landlord or Tenant, to the other party as the case may be. In the event Tenant's examination reveals an error has been made in Landlord's determination of Tenant's Pro Rata Share of increases in Operating Expenses, and Landlord disagrees with the results thereof, Landlord's accountant and Tenant's Accountant shall endeavor to agree on the matter. In the event Landlord's accountant and Tenant's Accountant are unable to reconcile their audits within thirty (30) days after Tenant's audit, both accountants shall mutually agree upon a third accountant, whose determination of Tenant's Pro Rata Share of increases in Operating Expenses shall be conclusive. In the event the amount of error by Landlord is determined to be ten percent (10%) or more of the total Operating Expenses set forth in Landlord's Statement, the reasonable costs of the additional two audits (excluding any charges billed on a contingency fee basis) made pursuant to this subparagraph shall be paid by Landlord. In the event the amount of error by Landlord is determined to be less than ten percent (10%) of the total Operating Expenses set forth in Landlord's Statement, the reasonable costs of the two audits made pursuant to this subparagraph shall be paid by Tenant. (e) Landlord's failure during the Lease Term to prepare and deliver any Statements or Budget Sheet, or Landlord's failure to make a demand under this Paragraph or under any other provision of this Lease shall not in any way be deemed to be a waiver of, or cause Landlord to forfeit or surrender its rights to collect any items of Additional Rent which may have become due pursuant to this Paragraph during the Term of this Lease. Tenant's liability for all Additional Rent due under this Paragraph 5 shall survive the expiration or earlier termination of this Lease. (f) Notwithstanding anything contained herein to the contrary, if any lease entered into by Landlord with any tenant in the Building provides for a separate basis of computation for any Operating Expense with respect to its leased premises, then, to the extent that Landlord determines that an adjustment should be made in making the computations herein provided for, Landlord shall be permitted to modify the computation of Base Operating Expenses, Rentable Area, and Operating Expenses for a particular calendar year, in order to eliminate or otherwise modify any such expenses which are paid for in whole or in part by such tenant. Furthermore, in making any computations contemplated hereby, Landlord shall also be permitted to make such adjustments and modifications to the provisions of this Paragraph 5 as may be reasonably necessary to achieve the intention of the parties hereto. (g) In the event the Building Rentable Area is not fully occupied during any particular calendar year, Landlord shall adjust those Operating Expenses which are affected by the occupancy rates for the particular calendar year, or portion thereof, as the case may be, to reflect an occupancy of not less than ninety-five percent (95%) of all such Building Rentable Area.